My plant has officially turned into a monster (since last time) and is taking over our kitchen. I have no idea how and when to crop it, and I'm afraid I'll kill it. Thankfully we have high ceilings in the apartment, but even so it probably won't fit soon enough. When ours was little we semi-stunted it by putting a growth light over so it's almost like a little bush now! Amazing how fast they can grow! I don't know why but of all my plants I am most attached to the avocado. We call it our plant baby. Hej och tack! :) Har lyckats lista ut det också efter lite googlande, nu är framförallt problemet hur en beskär på rätt sätt. Blir så himla förvirrad när folk pratar om att allt går bra sålänge man har ett bladpar kvar, vilket säger mig absolut ingenting. Haha, är en sådan total noob på växtskötsel. Om du har några fler tips så tar jag tacksamt emot! Perhaps you can put it on a bigger pot with more dirt and put it on floor level? After reading your post I decided to grow my own avocados and I have a little plant now :) What I read is that you have to keep pinching the top leaves but I am also afraid of shocking it or killing it! 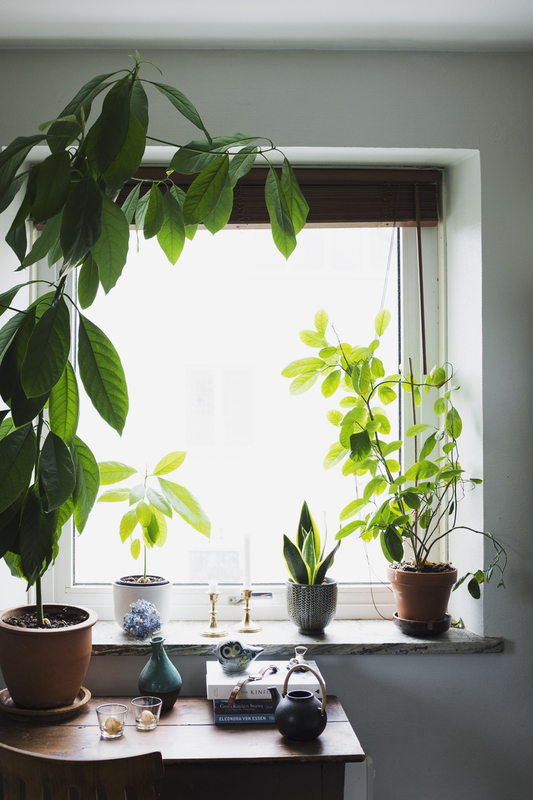 I wish I could have it on the floor, the problem is my cats would probably chew on the leaves and I hear avocado is toxic :/ Otherwise I love big plants on floorlevel. So happy to hear you have a little plant now :) Thanks for the tip about the top leaves! I guess I could do that on my big one now, and maybe keep it from getting to high at least.